While we invite you to share our wonder at the beauty and colour that we found in the very small portion of Ghana that we have explored, we also invite you to feel the horror that man inflicted on his fellow human. We have read and learnt extensively about Nazi Germany and the persecution of Jews under the reign of Hitler. But here, in this small corner of the world which is almost unknown to much of the modern world, was torture and murder of an equally large number of people … and all this to avail of an unending supply of cheap labour for the “New World”. The Caribbean and the Americas. If Africa can be described as the Dark Continent, it is because of this – darkness that was cast over a beautiful land and its peoples. There are 3 castles along the coast of Ghana. 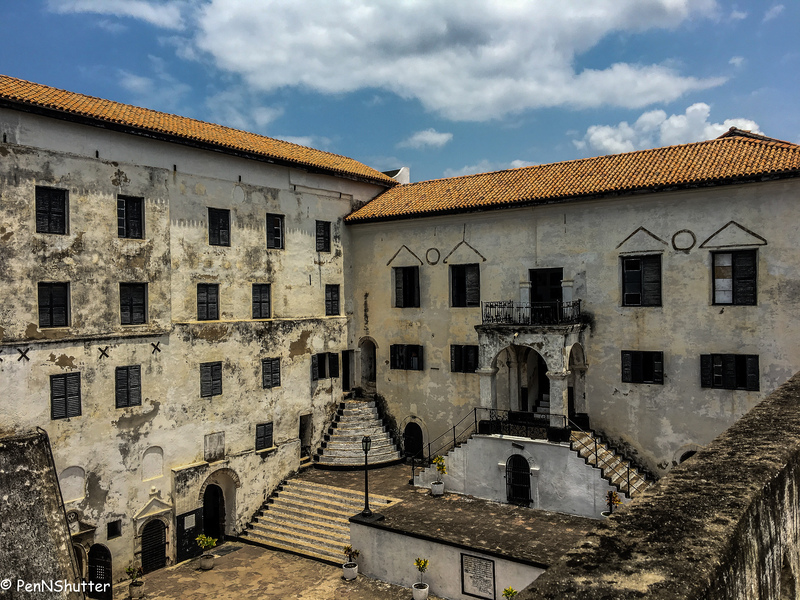 The Osu Castle in Accra was built by the Danes in 1661. 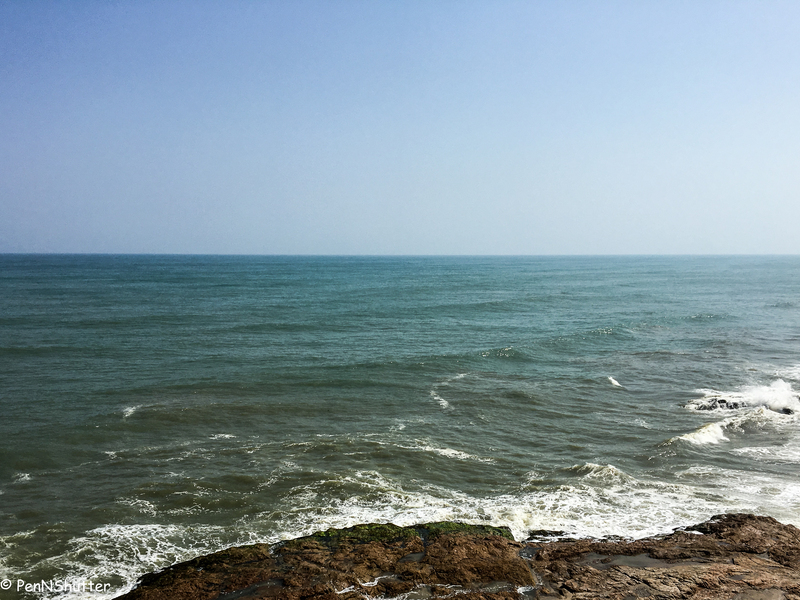 Further down the coast is the St. Georges Castle built by the Portuguese in 1482, now known as the Elmina Castle. It is the biggest and oldest European structure south of the Sahara. The Cape Coast Castle is the smallest of these three structures and was built by the British in 1665. The discovery of the New world by Christopher Columbus was the beginning of the Slave Trade. The Spanish who settled in America established plantations – tobacco, cotton, etc. These were labour intensive activities. They discovered that the white Indians / native Americans whom they enslaved and treated brutally were dying of tropical diseases. They needed a strong labour force. Bartolomé de las Casas, a Spanish chaplain, is said to have recommended Africans as alternative slave labour. African slavery proved to be very lucrative and subsequently exploded in the Americas. No matter how many Africans died while working the plantations, ships packed with new slaves for sale continually arrived from the west coast of Africa. Unlike the American Indians who were limited in number, they could be readily replaced. The Europeans came to West Africa to trade – guns, gunpowder, tobacco, smoking pipe, mirrors, etc. were exchanged for human beings. Men and women were captured and made to walk barefooted from across all of West Africa to these castles. Human auctions were conducted and depending on who the buyer was they were sent to different castles. To identify which slave now belonged to which buyer, each person was branded with the name of the company or the slave master – for identification. The process was exactly the same – and as painful – a red-hot branding iron was used to stamp the person on the back, chest or arm. This one act of brutality itself killed many. Once in the castles, the men and women were segregated. 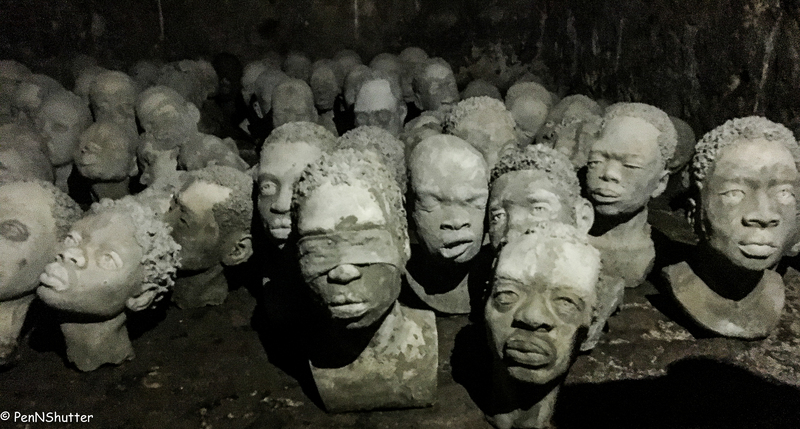 There were hundreds packed into each chamber of the dungeons to await the slave ships. 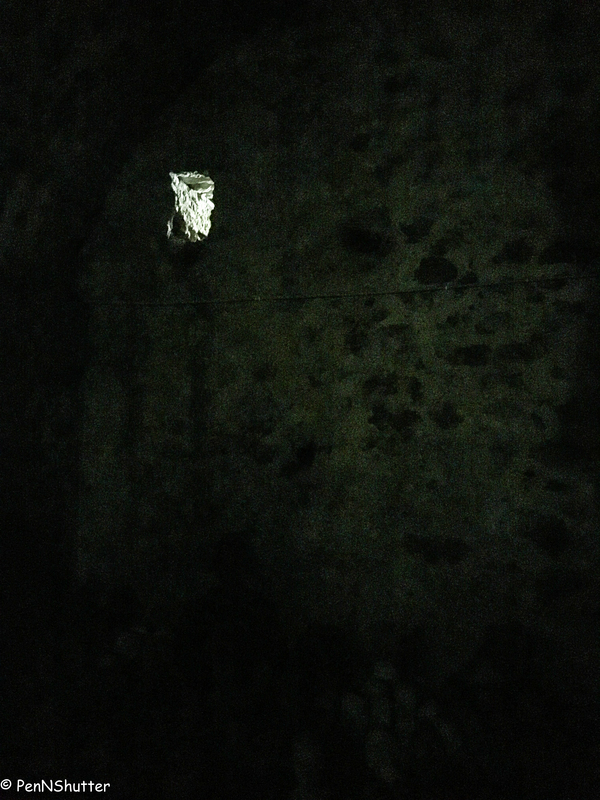 Light was minimal – mostly a small window, at roof level, set in thick walls. Food was served twice a day – quantity just enough for survival. There were no sanitation facilities for bodily processes. People urinated, defecated and vomitted on the same floor they ate, sat and slept on. Women menstruated there month after month. Nobody ever cleaned any of these cells. Depending on the wind direction the rain sometimes came in washed the filth through shallow gutters etched on the floors of the male dungeon. The female dungeons had no such gutters. Malnutrition and disease were obviously rampant. Malaria, diarrhoea, dysentery, fever. Many more died. 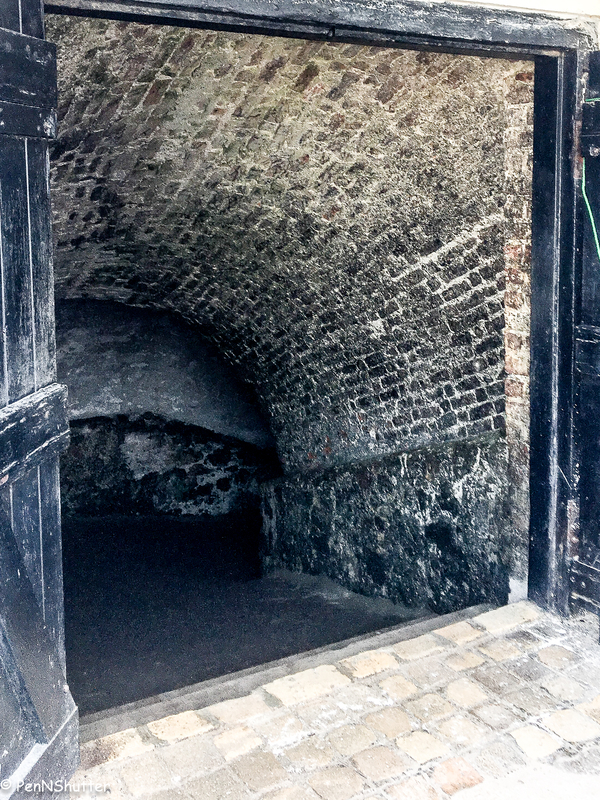 A tunnel going down to the dungeons at Cape Coast Castle. 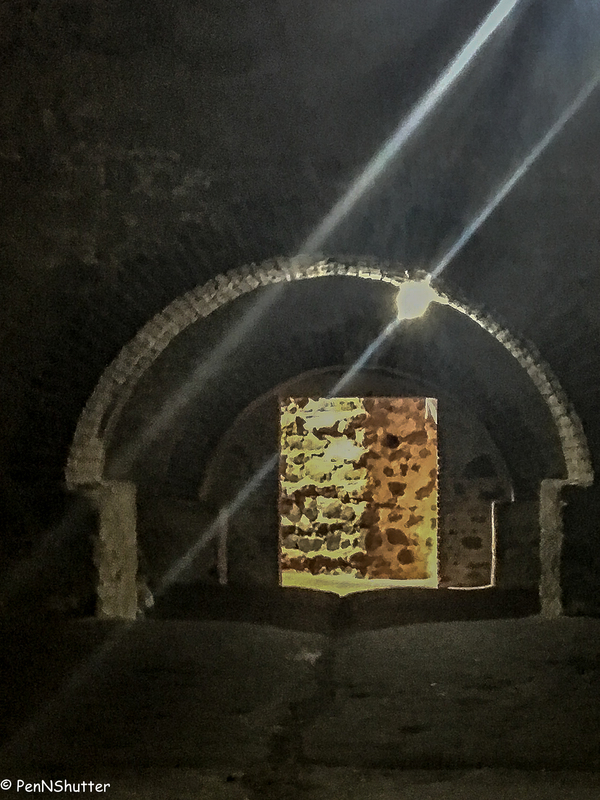 The dungeons now lit up for tourists. Excavations and study in 1974 revealed chains, shackles, human bones. Some research was conducted on samples taken from the floor. Saliva, blood, faeces, food, flesh … human waste – all make up the black floor as its visible today. The original floor of the dungeon is lost beneath layer on layer of this. 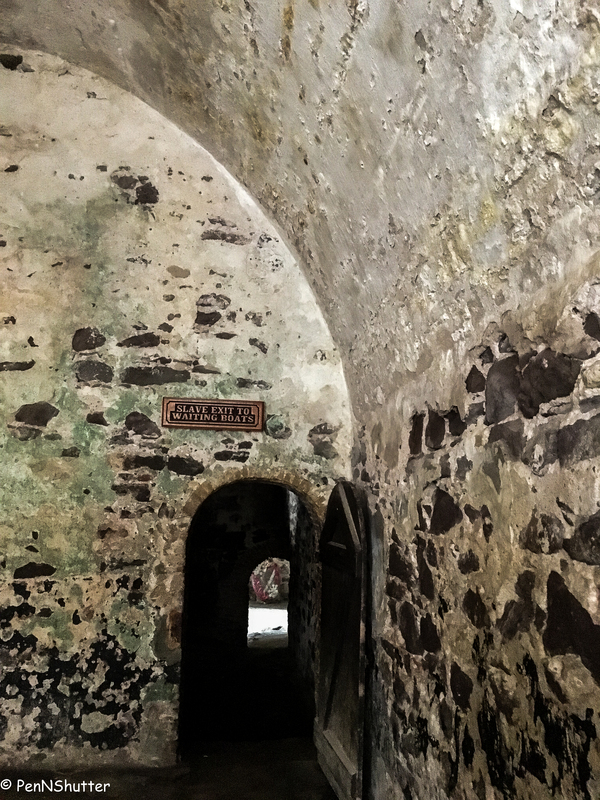 At the Elmina castle is a small room where errant and drunk soldiers were imprisoned to discipline them. They were fed through a small window which was the only source of light and ventilation. Often male prisoners protested or got aggressive with the officers. They were, after all, innocent of any crime. 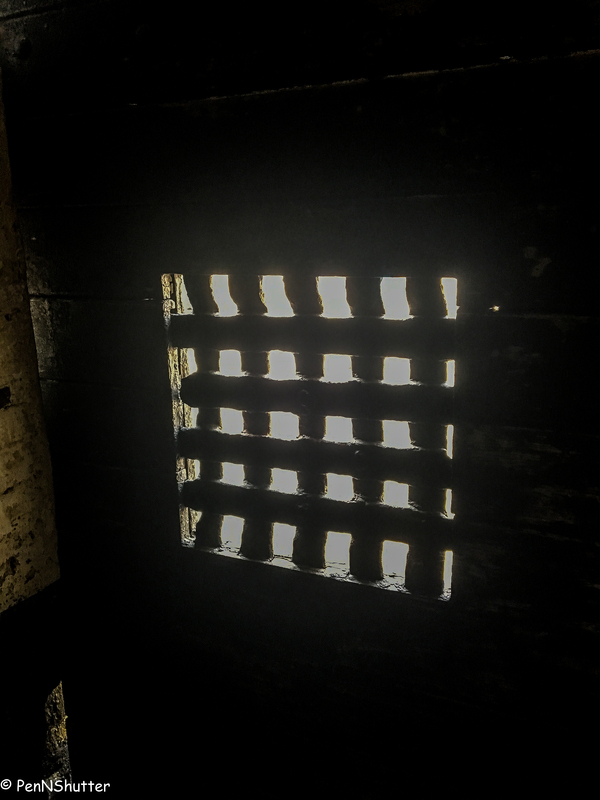 After repeated offences, such prisoners were put into the condemned cell. They were still shackled. There was no food or water provided. There was no ventilation in that cell once the double doors were shut. They starved and suffocated. No-one who entered that cell came out alive. In 48 hours they would be dead. Female slaves were always “available” to the officers for their sexual pleasure. The governor would stand at the door or on his balcony, look into the female dungeon and point to a woman who took his fancy. Servants took her out, she was allowed to bathe and clean herself and handed over to satisfy him. The stairway women were led up – to the Governor’s rooms. If she got pregnant she was given medical care and accommodation till the child was three months of age. The baby was then taken away by the governor and later educated in the village. With lighter skin and European names they were “half-caste”. The woman returned to the dungeons. Any woman who refused to be abused and raped was placed in solitary confinement in the punishment cell. 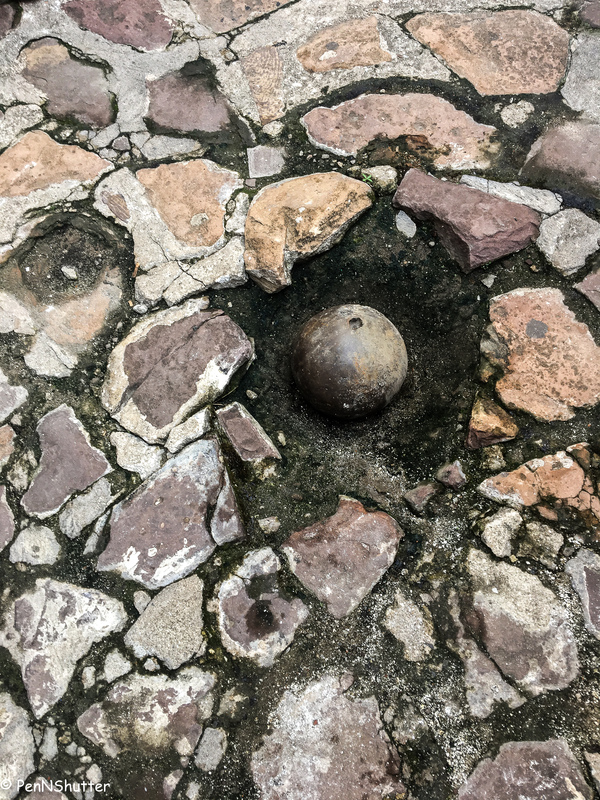 In the Elmina Castle the women were tied to a cannonball with chains at their ankles and left in the open as punishment – they were to serve as a lesson to other women – not till they died, but long enough that they starved and suffered. Women who were found to be pregnant when they were aboard the ships were a liability. No plantation owner would buy her off the company. There was a simple solution to such a problem. These women were “off-loaded” into the Atlantic ocean for sharks to feed on them. They lived there, these poor creatures, in the shadowy darkness, for months. When they were brought out many were partially blinded by mere daylight. Once the ships arrived, they were taken to a naturally brighter chamber to be “sorted” according to their owners. The weaker ones were examined by doctors, the stronger ones were walked into a tunnel to shift them to the waiting ships through the “door of no return”. Not everyone who walked through the door survived to tell the tale. Not knowing what further horrors awaited them, a number of prisoners chose to commit suicide. 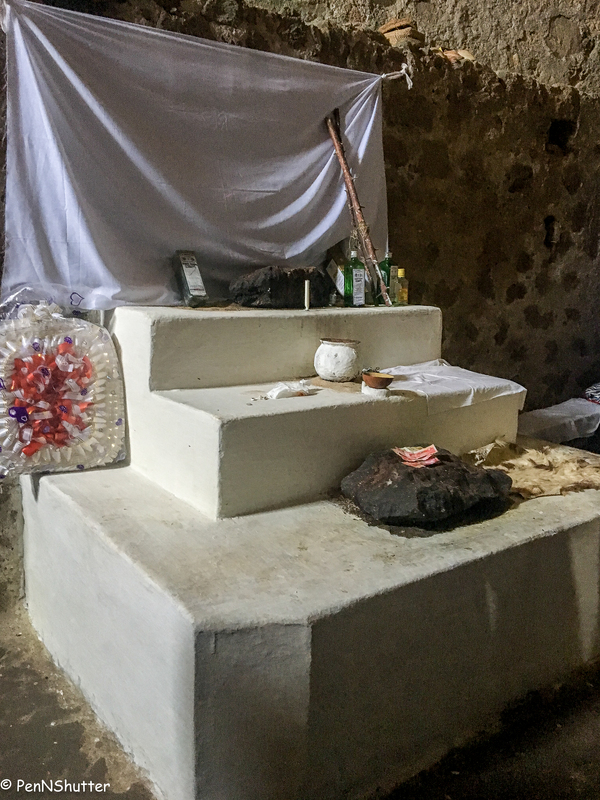 Before the castle was built there existed a traditional African temple to worship natural creations – stone, rivers, mountains, trees – and to make offerings to ancestors – who are believed to be closest to God – that these ancestors would help get their wishes fulfilled. After the castle was built, the British denied the right of the local people to worship there and the shrine was shifted out. Once the slave trade ended, the shrine was returned to its original location – the chamber of sorting. Today, visitors, especially African Americans, lay wreaths in memory of those who died here, their ancestors. 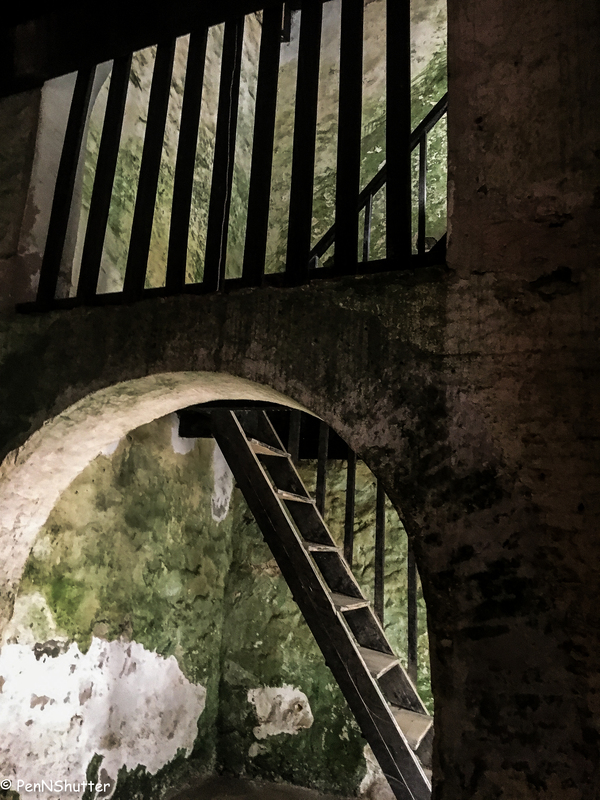 Climbing a level above the dungeons, are the rooms where the governor lived. The difference is stark, even today. As you walk into these rooms, you can feel the cool breeze blowing from the ocean. You can see the brightly lit vistas of land and sea. The governor’s rooms had high roofs and large windows. 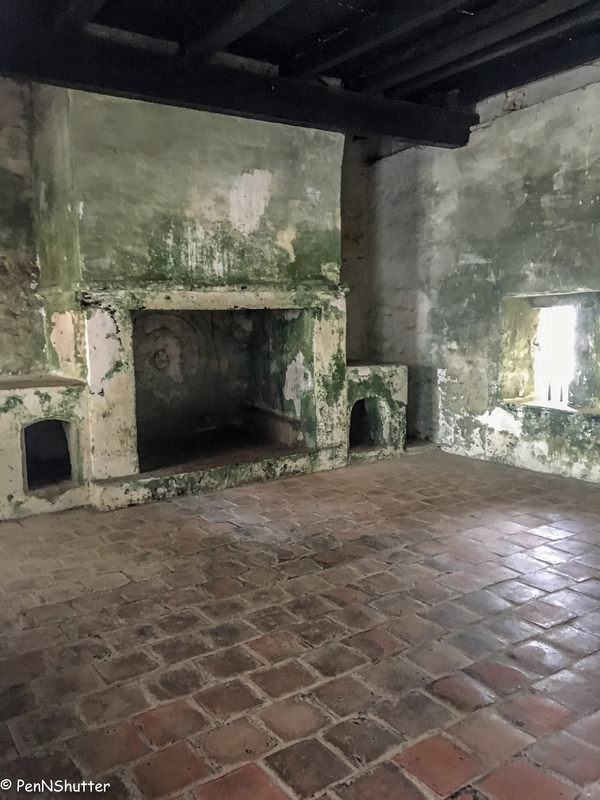 The Elmina castle had two huge kitchens, washrooms and an entire floor each for the deputy governor and the governor. Thousands lived just below, starving in darkness and filth. The castles today house gift shops with local artwork and books about the history of the country. 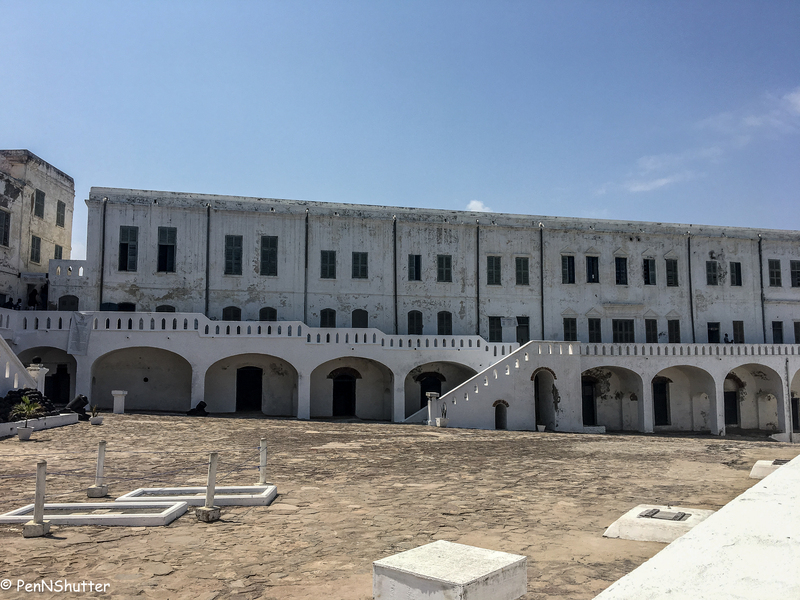 The Palaver hall, (Palaver – Portuguese – to bargain, to negotiate) in the Cape Coast Castle is where the buying and selling of humans used to be held – it was the marketplace for the British. 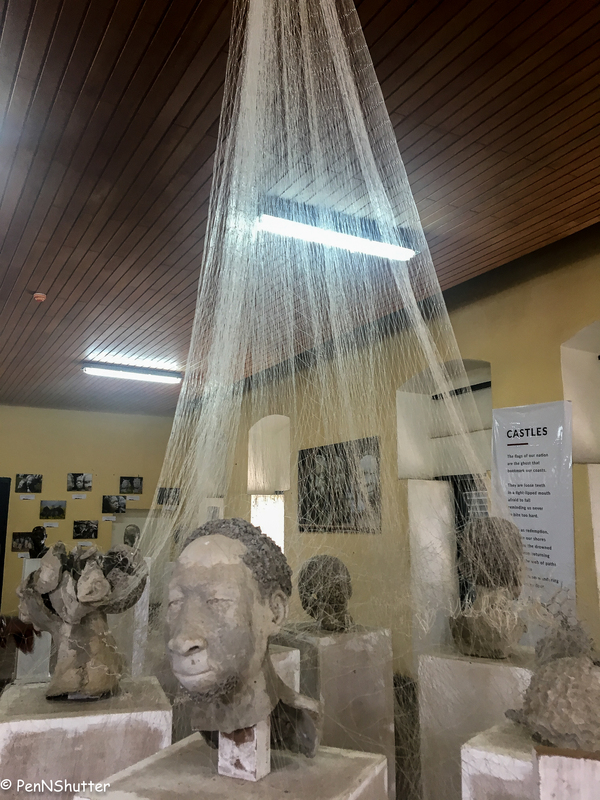 Today this hall holds an exhibition – the Nkyinkyim Installation – Portraits of the Middle Passage by Ghanaian artist Kwame Akoto-Bamfo. The “Middle Passage” was the stage in the triangular trade when African slaves were shipped to America and the Caribbean. The ships left Europe with manufactured goods which were traded for humans in Africa. These humans were then sent on the same ships to the New World and traded there for raw materials and other goods that were finally returned to Europe. The Middle Passage was considered a time of in-betweenness for those being traded from Africa to America. 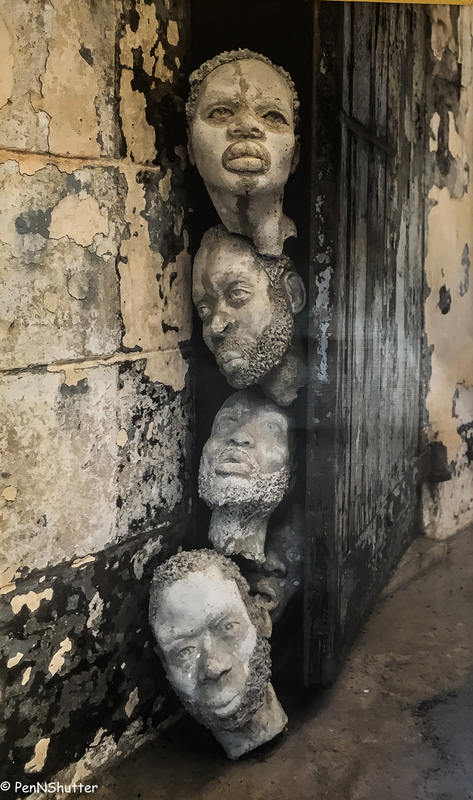 This is an exhibition of sculptures, a representation of the faces of the slaves. 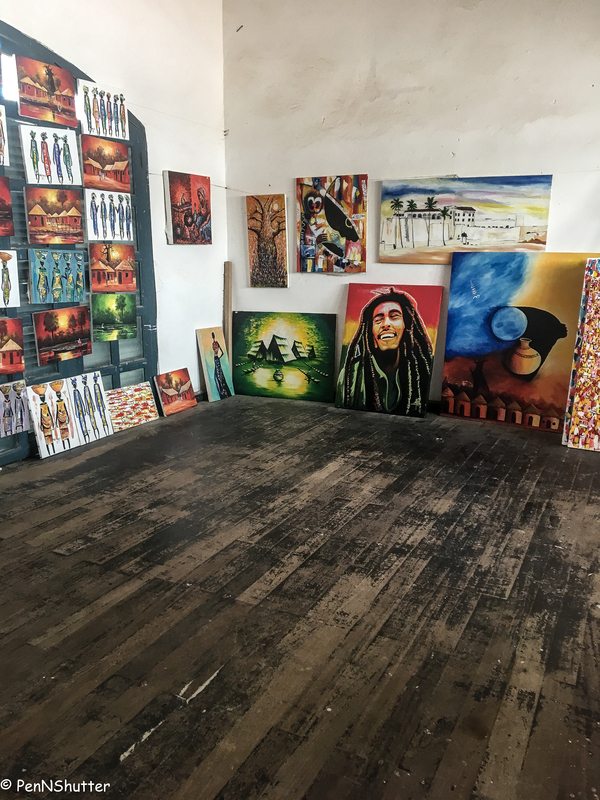 The artist has created 1300 pieces, most of these are placed in some of the dungeons. Every face evokes emotions too deep for words. Misery, horror, pain, anguish, depression. 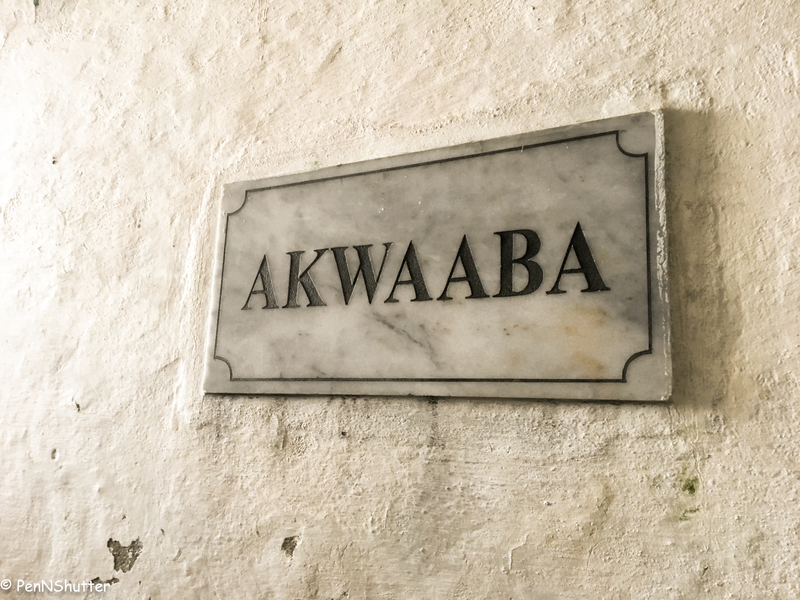 On the walls of the Palaver Hall are posters of some verses penned by Hakeem Adam, an Accra based writer – he was impelled to write them after viewing this exhibition. 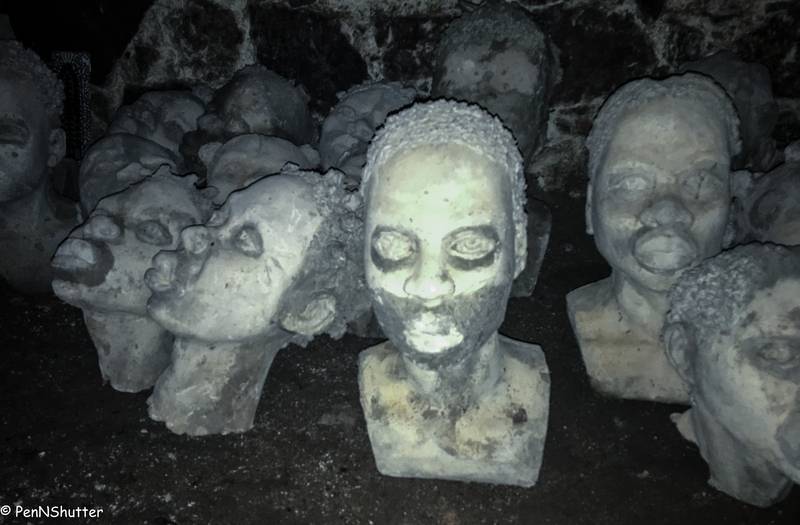 The total estimated deaths attributed to these castles is about five million, making the Atlantic the largest graveyard of the African people. 1998, 400 years after the first slave ship landed in the New World. In an emotional ceremony, the bones of two former slaves from the Americas, Samuel Carson from the USA and Crystal from Jamaica, were brought back through the “door of no return” by their descendants – … a symbolic return. The bones were interred in the slave cemetery at Assin Manso. The guides who take you on tour of these castles end their talk saying they have a request to make of us … cynicism deeply ingrained in us, we expect to be asked for a handsome tip. They ask us, “Is slavery over?” They remind us that the slave trade is still rampant in the modern world – child labour, child trafficking, child prostitution … and so many other forms. They ask us to learn about the history of this place and remember the horrors of the past. Then they ask us to not hate. “Go home and educate your families, your friends, to avoid discrimination. To say “no” to racism. Once we start discriminating, we begin to fight among ourselves. Once we fight among ourselves we can never make the world a better and safer place for all of us to live. Love one another. May the Good Lord God protect you and take you back home safely till we meet again some other day, some other time.” We are left humbled by these words. We are left ashamed at our own shallow, preconceived notions of what a person may ask of another. We leave the castles in silence. Unable to formulate a single thought or speak of what we had heard, seen and felt. The silences and shadows in the dungeons speak loudly. We need to listen. Thank you. It’s truly a sad tale. But a beautiful country and people. Speechless ! Numbed ! With this write up , I could feel the torture and horror that the victims must have gone through! A sad tale written brilliantly ! It’s a sad chapter in the history of “human” “civilisation”. Spine chilling. ‘Roots’ comes to mind. I haven’t read the book in decades, but I remember the story of Kunta Kinte left me so sad. This tale does too. The place is beautiful. It’s well worth a visit to marvel at the clean building lines themselves. As for the rest, if we don’t have the courage to learn – second hand – about ourselves, how will we ever change and make changes to the future? That sure was horrifying and gloomy . i for one would never have the guts to visit this place . reading your blog is enough for me to experience places through your eyes ..
What we actually seem to be doing though is creating more such tragedies … 😞 why don’t we learn from history? Sobering, and so very powerful. We can and must do better. If only we could recognize that we share our brief time on this earth together. Thank you, Meenakshi. And we continue to inflict pain on our fellow creatures. We don’t seem to be very evolved. We have visited these castles twice (thrice for Sid) over the last year. 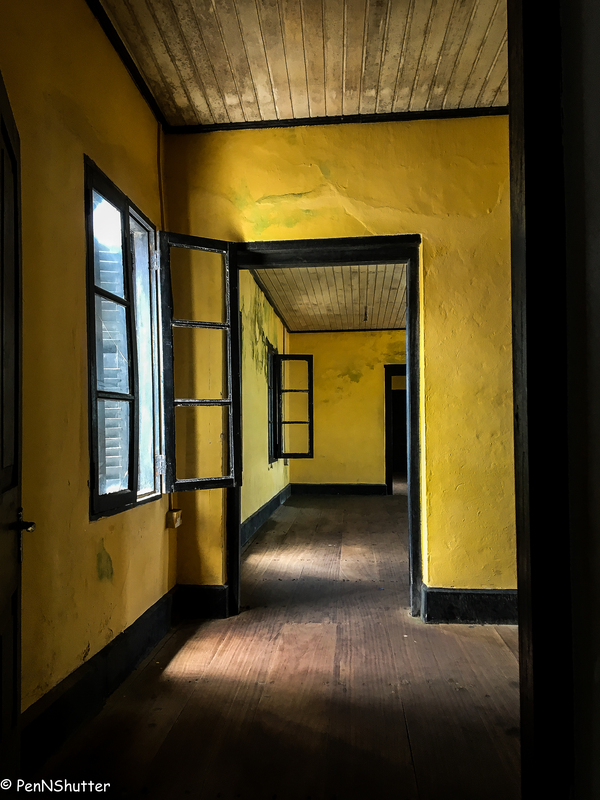 And each time it’s been as impactful … it’s as if the walls and floors have got steeped in the misery. They speak by their very existence. 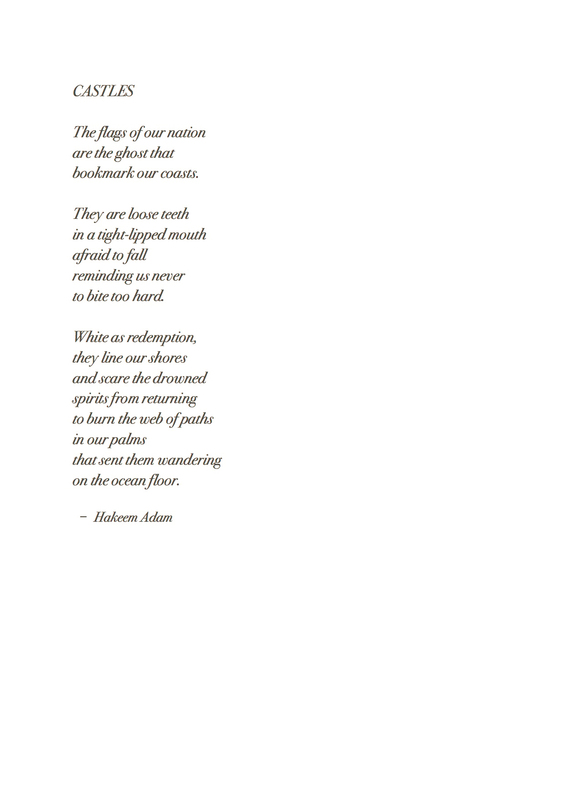 This provocative note on the slave trade of Africa brought tears to my eyes. The pictures were evocative and communicated extraordinarily well. I expanded each picture and was amazed at how well you had conveyed in words what the pictures also said. So thank you for that. Having said that, I am so disheartened at how little we know of this gross blight on humanity. 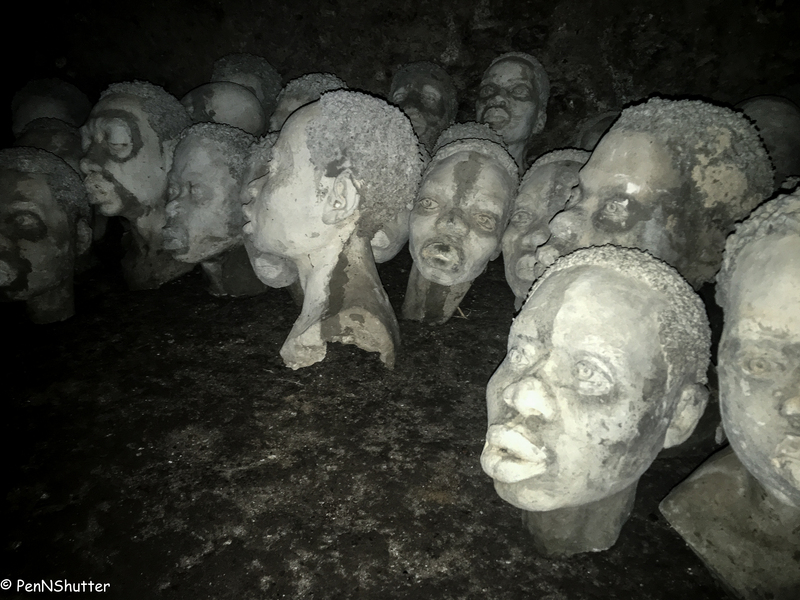 While many are aware of the slave trade in general terms, I don’t know that most of us are aware of the gravity, the cruelty or the scale that it entailed. Thank you, again for putting the spotlight on this human embarrassment! If we don’t learn from history, as they say, we are condemned to repeat it. I hope we never do. Please keep writing, keep sharing, and keep a spotlight on all those egregious things we do so others may learn from it. Wow! Deep and so dark! How did we, as humans do this to another of our own species? What depravity! What pain! And the pain continues for centuries! But once again your writing and your pictures spoke so deeply and touched me so profoundly!